Date: Friday 13th April 2018. Venue: The Oxford and City & County Bowls Club, Marston Ferry Link Road, Oxford. Attendees: Colin Barson (CB), Matt Cavill (MC), Jem Faulkner (JF), Simon Bradbury (SB), Trevor Lambert (TL), Ali Wolfe (AW), Michael North (MN), Jemma Hayward (JH). Apologies: Maurice Earp (ME), Graham Butler (GB). (a) It was reported that The Trust bank account remains strong with over £12,000 in available funds. The audited accounts will be issued to members at the AGM. (b) It was reported that all payments and fees are up to date and nothing is owing. (a) TL took those present through the latest membership details. We now have 1004 members, which is up from the 986 at the end of the year. (b) It is pleasing to note that membership continues to grow and that getting over the 1000 mark has now been achieved! (c) Twitter and Yellows Forum continue to be valuable communication mediums for OxVox. (e) TL confirmed that MailChimp is working well for member communications. (f) Member 1000 was Tom Ware. A life membership will be awarded to Tom. TL will action. (a) Those present discussed recent meetings and communications with the new owner ‘Tiger’. (b) JF updated recent conversations and that the Trust is now in regular communication with Tiger and that a WhatsApp group has been put in place with Tiger and is working well. Direct line phone numbers and email addresses are also now in place. Both men are business associates of Tiger and first became properly involved with him after they had purchased Reading FC from Sir John Madejski. (d) Both Pairoj and Jack describe themselves as football investors and have been involved in the purchase and development of Manchester City, Cardiff City, Leicester City and Reading FC. The track record at these clubs is good in terms of their development/success. (e) The Reading FC sale to Chinese investors did not include circa 20 acres of land, which in conjunction with Reading Council is being developed for housing. The Thais did develop a significant conference facility for Reading FC during their tenure. (f) Tiger has confirmed that it is unlikely that either Pairoj or Jack will join the OUFC Board, but are definitely in advisory roles that will work/focus on the club’s on and off field development. OxVox have communication lines open with both men (as well as of course with Tiger). (g) There are some concerns over immediate cash flow at the club, but we have been assured that these issues will be resolved over the coming weeks/months. The management style appears to be to provide cash/funds when they are needed, rather than inject large sums for use day to day by the club. We will monitor this, but there does not seem, at this stage, to be any cause for alarm, other than that it is a ‘different’ approach. (h) Tiger has confirmed that LionTrust will not be the shirt sponsor next season. He is in discussion with Singha Beer for what would be a significant new deal over several years. The meeting discussed the beer being in the stadium and that this has already been agreed with the stadium company. (a) JF relayed the most recent conversations that he has had with Firoz Kassam. (b) FK is still of a mind to not move forward with any meaningful way with a change to the stadium ownership and/or lease/license arrangements, until such time as the new ownership of the club has settled in properly and the arbitration issues are resolved. (c) JF will meet FK in the next couple of weeks. He’s more than happy to meet the Thais. A new relationship may well prove to be beneficial to the agreement of a new arrangement. (d) The meeting again discussed the recent members’ meeting at which ‘stadium’ was a major topic for the 100+ members who attended. Further follow up meetings with all the local councils, and key officers, are planned during the summer to discuss options. (e) The meeting discussed the news, as previously communicated to members, that a new rail line and station is now likely, with the new station located adjacent to the science park. The rail line already exists, but work will be required to bring it up to standard for passengers. It was confirmed at the meeting that OxVox have now made contact with Chiltern Railways and a meeting is to be agreed during the summer. (f) In conjunction with significant new housing (which is still subject to a planning review and therefore confirmation) on the other side of Grenoble Road, it is still felt that the rail line could provide significant opportunities for OUFC and its fans in terms of ‘travel & access’ etc. 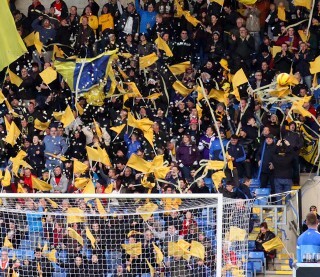 (g) Given that a more equitable solution can be found, the committee are still of the belief that Grenoble Road can be a long term and successful home for OUFC. The committee are still of the firm view that stadium and club under separate ownership is desirable. (h) The meeting confirmed that the renewed Community Right to Bid (CRTB) documentation has now been sent to Oxford City Council. This will be the UK’s first renewal application. We are likely to hear news by the end of May. (b) The AGM will take place on April the 28th 2018 at 12.30pm. (c) The meeting discussed the future makeup of the OxVox committee following the AGM. (d) CB, MC, TL, AW, MN, ME confirmed that they wished to stay on as committee members following the AGM. (e) JF, SB and GB re- confirmed that they would not be seeking re-election and would be standing down at the AGM. JH confirmed that she wished to move to a co-opted role – the new committee will need to agree this at their first meeting. (f) TL will be preparing the relevant papers regarding the AGM and these will be sent out, via email, to members over the next couple of weeks. (g) With 4 full member vacancies, the meeting discussed members who’ve put their names forward. The committee are delighted at the high quality of applicants. (h) Once the new committee is formed at the AGM, this will quickly be followed by the new committee holding a meeting and electing a new Chair, Vice Chair, Secretary and Treasurer. (i) JF said he would personally write to members ahead of the AGM, probably as part of the performance report. (j) Tiger will be invited to the AGM. JF will deal with this. (a) JF confirmed that he has attended SAG (safety advisory group) meetings at the stadium. The club are working on an exciting safety initiative, which hopefully can be communicated by Mid May. (b) It was confirmed that the club had actively engaged with OxVox on season ticket pricing for next season. Ticket prices will be ‘frozen’, with no increase on this season’s prices. This was welcomed by the committee. (c) OxVox are speaking with the club about a pre-season tour. It is likely to be Ireland. No details have been received as yet. (d) WSL (OUFC Ladies) was discussed and OxVox is seeking clarification on funding for the current season. Financial losses on this season may well have an impact. (e) It was resolved to continue to push/support the upcoming Les Robinson testimonial dinner with social media support. It was agreed to take a half page in the program – cost £100.